We have the best little library in the world and we've been a part of one of the best reading programs ever. This reading program is called Paws to Read and it's great on two levels--no even more than that. 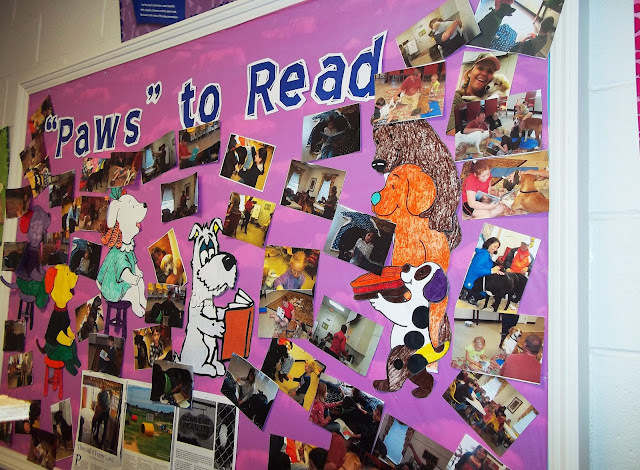 The children meet at the library and get to read to dogs! This is one of the best rescue dogs stories. These dogs were abandoned dogs who were rescued dogs. It gets better. These dogs get sent to jail!!! I know... can you imagine...keep reading because it's not what you think. What would a dog do in jail? While the dogs are in jail, certain prisoners get to help train and rehabilitate the dogs. Once the dogs graduate from the program, they're trained and many families want them. From everyone who has a dog, I've heard that they are the best dogs they have ever had. The dogs in the reading program at the library were also trained to sit and listen to books. Now, this beats every summer reading program around! I heard that a while back on Christmas eve, the prisoners even read The Night Before Christmas to the dogs as part of their training. Did I mention how good this program is for the prisoners? We'll if you walk in the best little library in the world, you'll see children reading to dogs and dogs listening with their ears alert. It's so great. Teaching is great, and I hope you enjoyed this Sweet Tea moment as much as I did. I've got another Sweet Tea moment planned for you. Check back soon to learn about a reading program freebie!